This is TouchAccess 200, a durable, intelligent lock from Videx that is easy to install on cabinets, file drawers, and storage chests. The keys used with TouchAccess 200 are small electronic buttons that uniquely identify each user--no two keys are alike. When an authorized user touches the lock with their key, their key ID is recorded in the lock with the current date and time. Any attempt to open the lock without an authorized key touch will sound a local alarm, and the mechanical lock will not open. 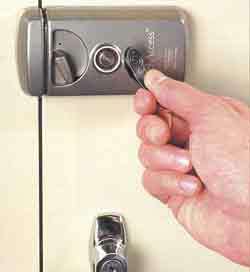 Locks can also require two, three, or four keys for an authorized opening. You control who has access, and at what times. Some workers may have 24-hour access, while others may only have access from 8:00 am to 5:00 pm Monday through Friday. Holidays and non-work days can be easily blocked out. 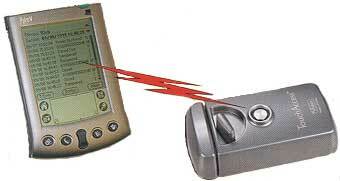 The comprehensive audit trail stored in TouchAccess 200 is read out later with a Palm III or Palm V handheld organizer, using Videx AuditLink software. Copyright 2002 - M.V.M. Security Co., Inc.